Western Mail Coaches, Mud Wagons, Overland Wagons, Concord Coaches, Celerity Wagons and Stage Wagons. Ultimately, there are a variety of names given to the different styles of early horse drawn stages used across America in the 1800’s and early 1900’s. In spite of the thousands built by a number of different firms, most have not survived the passage of time. Some met their end through accidents, runaway teams or an assortment of other hostilities in the remote regions they traveled. Others were abandoned, left outdoors and allowed to succumb to the ravages of time and weather. 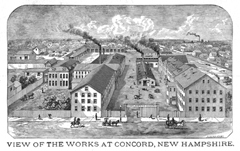 Downing’s history is traced to 1813 when Lewis Downing first began making and repairing carriages in Concord. In 1826, Downing hired a young man by the name of J. Stephen Abbot. Abbot already had a significant talent for building quality coach bodies and, by 1827, the fruits of that partnership began to take on increased significance as the first of a long line of legendary Concord Coaches were built. 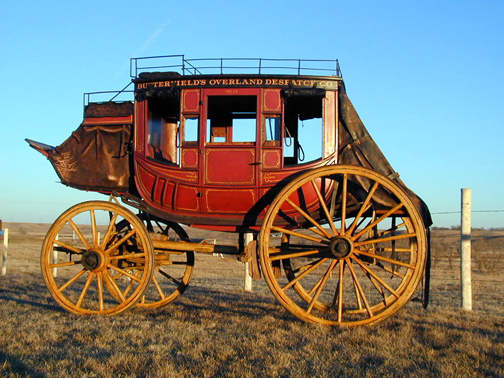 In 1868, Wells Fargo further acknowledged Abbot-Downing’s leadership and renowned reputation for superior quality by placing the largest single order ever received for these vehicles. They ordered thirty Concord Coaches and shipped them west by rail. While there were other vehicle makers geared to the business interests of stage and express companies, those firms with a leadership statement to make often chose Abbot-Downing vehicles to reinforce their own status in the marketplace. The history of the Abbot-Downing company is a story in itself and will be given more coverage by this site at a later date. Suffice it to say that even with the popularity and western legacy of the Concord Coach, Abbot-Downing was also well known for their express wagons, buggies, drays, sprinkler wagons, business wagons, and other vehicles. The smaller of the two Abbot-Downing vehicles owned by the Booth Museum is often colloquially identified as a “mudder” or “mud wagon” and, according to noted Abbot-Downing historian, Ken Wheeling, even more appropriately labeled a “stage wagon.” Built to travel over mountainous terrain and unimproved roads, this rugged set of wheels was referred to as a ‘Heavy Overland’ in period catalogs and was designed to carry up to nine passengers. The stage came to be known as the ‘Red Bird’ and, according to vintage newspaper accounts, it was purchased new around 1889 and put into service on the Lewistown, Montana stage line. Throughout its years, this stage wagon carried mail, passengers, bullion and payroll for Montana mining companies along the routes to Great Falls, Lewistown, Fort Benton, Mondak, Glendive, Landusky, Chinook, Zortman and Malta. In fact, at one time, it was also referred to as the Zortman-Malta stage. Running throughout Montana, some have even pondered the likelihood that Butch Cassidy and the Sundance Kid may have been among its passengers. After two decades of hard service, the progress of 20th century transportation and communication finally caught up with the Red Bird and it made its final run in July of 1914. As such, it has the distinction of being the last stage to run in Montana. 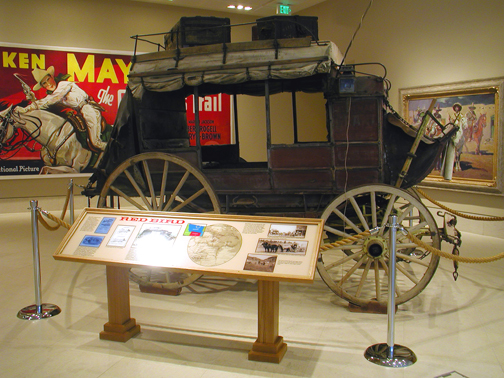 Today, this rare, Heavy Overland stage wagon is still in its unrestored, original condition and is on exhibit in Cartersville, Georgia. Visitors are given an extraordinary opportunity to go beyond the facade of popular western movie fiction and witness a stage that looks just as it did (minus some trail dust) when it was decommissioned nearly 100 years ago. The Booth Western Art Museum’s other stage is a nine passenger Western Mail Coach fashioned with the majestic lines and extraordinary craftsmanship typical of the legendary Concord Coach. Carrying the serial number 84, the history of this vehicle can be traced to the early Fall of 1865. Just months after the close of the Civil War, Abbot-Downing received an order to build twenty coaches for Dave Butterfield’s newly-formed Butterfield Overland Despatch. Ultimately, only twelve coaches are believed to have been built. As part of that original order, number 84 stands as an amazing testimony to the entrepreneurial spirit of America’s pioneers. The Butterfield Despatch has a name similar to another historical legend; but should not be confused with John Butterfield of the famed Butterfield Overland Line which traveled from St. Louis to Abilene and on west to Tombstone and San Francisco. This line was tasked with providing a passenger transportation and mail route to California. In contrast, Dave Butterfield was a successful entrepreneur from Denver with a keen acumen for business and a strong desire to capitalize on the freighting opportunities in the West. In the early 1860’s, Butterfield recognized that much of the westward transport of freight from St. Louis and Kansas City was handled by independent contractors with slow-moving ox teams. Those on the receiving end of the goods and supplies were having trouble getting materials fast enough. Butterfield’s organizational skills and business contacts in the West put him in an ideal position to help expedite the process and pocket the rewards. In early 1865, his plan began to take shape when he secured significant financial backing for his newly-formed Overland Despatch. Butterfield concentrated on the freighting portion of the company first, but soon began to focus on opportunities in the stage express and passenger business. Back in a New York City office, all of this extra freight and staging activity did not go unnoticed by Ben Holladay ( Holladay Overland Mail & Express Company ). Up until that time, Holladay had enjoyed a strong monopoly in the western express and staging industry. He wasn’t about to give in to a newcomer and forfeit his lucrative control without a fight. Shrewd, imposing, and fiercely competitive, Holladay went to work on the foundation of Butterfield’s domain – intimidating and leveraging the New York financiers, finally coercing them into selling the operation to him. The tactics were questionable, but clearly effective. Despite the early promise shown by the Butterfield Despatch, all the property (including coach #84) were turned over to Ben Holladay by March of 1866. Often referred to as “the Stage Coach King,” Holladay saw the rapid progress of the transcontinental railroad construction and decided to sell his empire of stage lines and equipment to Wells Fargo later that same year. The renowned banking firm paid an estimated $1.5 million in cash and $300,000 in Wells Fargo stock for the lines and assets of the Holladay Overland Mail & Express Company. (again, this included coach number 84). In 2001, coach number 84 was sent to Doug Hansen of Hansen Wheel and Wagon Shop in South Dakota for sympathetic restoration and conservation. Specialists in the preservation, conservation and restoration of authentic western vehicles, Hansen’s team of craftsmen were tasked with restoring the appearance of the vehicle to its original 1860’s used condition. As such, every inch of the coach was examined for structural soundness and functional integrity. While it was in surprisingly solid condition, the careful and painstaking commitment to maintaining historical accuracy in the restoration along with the documentation and development process still took more than a year and a half to complete. The finished project was delivered to the Booth museum in May of 2003. Today, Abbot-Downing coach number 84 and Red Bird stage wagon number 66562 stand as impressive reminders of our nation’s great western heritage. From the walled shops of Abbot-Downing to the vast landscapes of the west, the hard work, independent spirit and continued growth of America built a lasting legacy of leadership and an unparalleled tribute to the real Stages Of Life. For more information on the Booth Western Art Museum, its exhibits, events and offerings, contact them at www.boothmuseum.org or write P.O. Box 3070 Cartersville, Georgia 30120. Research for this article led us to the 1934 book, Old Waybills by Alvin Harlow; StageCoach West by Ralph Moody – copyright 1967; Six Horses by Captain William Banning and George Hugh Banning – copyright 1930; and also the 1874 Statistical Gazetteer of New Hampshire. We are also extremely grateful for the assistance and generosity of the Booth Western Art Museum in Cartersville, Georgia and the expert guidance of Doug Hansen at Hansen Wheel and Wagon Shop. Additional credit is due Ken Wheeling for his support in developing this “Featured Vehicle” review. 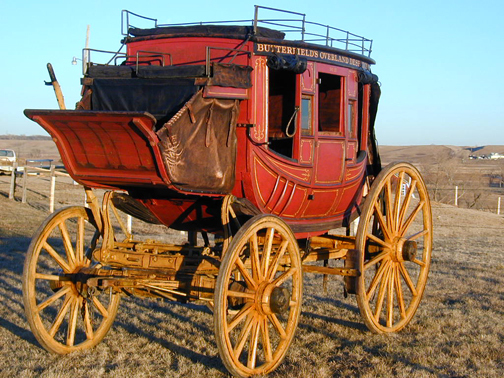 Mr. Wheeling’s contributions to the provenance and research of America’s Concord coaches, stage wagons, and other horse drawn conveyances is well known and continues to be an important treasury to the study of early western staging vehicles.